Some of the formality of past generations has lost its meaning in today’s households. Many of us have a formal dining room that we never (or nearly never) use. Perhaps you have plenty of room in your eat in kitchen or great room that includes space for a daily dining table, yet you have the bones of a house with space provided for a formal dining room. Break with tradition, use the space however it will suit you best. To create an office, move out any dishware or china cabinets, but take another look at the table, you may be able to use it as a desk or work surface, it could even be large enough to use as a shared desk for two. If you have a buffet with cabinet-style storage space, that could also work to store files and books, if not add a bookcase and a few filing cabinets or a console. Keep the side chairs for guest seating, but you’ll probably want to pick up an office chair for comfort if you tend to spend long stretches of time working in your new office. This set up will enable you to revert the room back to a dining room if you ever host a large holiday dinner. Option two is to start from scratch with standard home office furniture, including desk, chairs and console. Or to make the most of your space, look into built-in home office solutions. Be sure that your home office still feels like part of your home, include a nice area rug, artwork and some stylish lamps. If there is room, set up a seating area as well with a sofa or love seat and a few club chairs, with careful planning, you may be able to work this into overnight guest accommodations by investing in a sleeper. 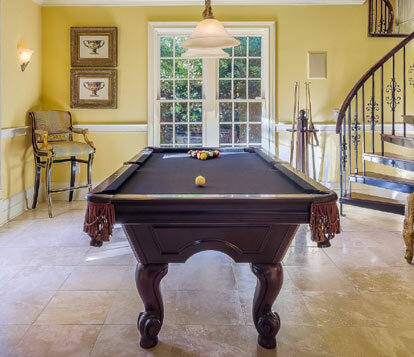 Whether you’ve got big toys like a pool table or if electronic gaming is more your style, many singles, couples and families have found that having a game room instead of a dining room is just what they need to add a bit of fun into their lives. Game tables, like pool or foosball go for upscale pool hall look. The pool table and playing clearance will take up much of your room, but chances are that you will have space at the ends for some seating – either counter or bar height table and stools will work well in this type of room. Also think about adding a bar or sideboard to the room, you’ll want a handy place to rest your drink or snack since your game room will be the center of attention whenever you host a party. If have extra space, add a sofa and chair Consider making it a sleeper sofa or futon and your room will do double duty as a space for overnight guests. If video games are more your style, you’ll be designing a room with an entertainment center and plenty of comfortable low seating. For this room you’ll want a console or media center stand for your flatscreen with plenty of room to store game components and accessories. For seating, a sofa and accent chairs or sectional would work well. Don’t forget to include tables for between game drinks and snacks. The set up could be much like a smaller, singularly focused living room. If you plan on having big groups together for gaming nights, think of adding stool height seating behind the sofa serving as a second row for spectators. This room will benefit from having a comfortable area rug as well as some oversized throw pillows, many kids routinely sit on the floor to play video games. 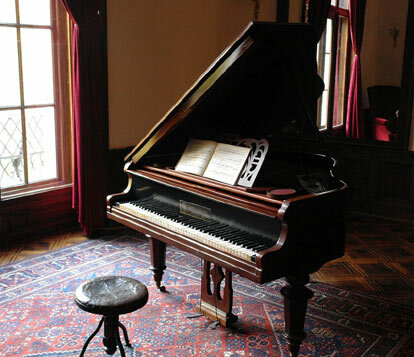 If music is your passion, without the dining room table your room will have space for even the largest of instruments. Whether classical or contemporary, the sky's the limit. You’ll be able to fit a piano, have space for a 5 piece band and anything in between. Often when putting together a music room, musicians will install wall storage so that their instruments serve as art displays on the walls while not being used. To furnish this type of room, consider how much space will be needed for musicians, and then create a comfortable seating area for spectators. It makes sense to keep things flexible for re-configuring the room, chairs work better than larger seating furniture pieces. Acoustics will be important to your music room. If you have hardwood floors, you may want to add an area rug to help with sound absorption. Take a deep breath and give yourself a daily reminder to slow things down by creating a meditation room. You’ll want to clear the room of nearly all furnishings and go with minimalist styling. 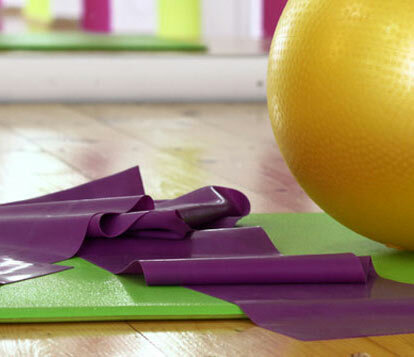 All you may need are a handful of perfectly positioned throw pillows and a place to store your yoga mat. To create the tranquility you need, decluttering is key. A cleanly designed low storage cabinet or console will provide a place to store anything not in use, and give you a surface to place tea service or inspirational sculpture. People are tossing out convention and repurposing their dining room space to better fit their lives. Here are just a few ideas to bring new utility to your underused space, reflect on your lifestyle to decide how you can get more out of your home. Are your little ones and their toys taking over your home? Keep the kiddy-clutter contained in by creating a playroom out of your unused dining room. Look for bookcases and storage cabinets and bins that can contain their favorite books and toys while keeping them accessible to your tots. Add in a kids table and chair set so they have a place to work and create. Top it off with a colorful rug and some comfy seating so they’ve got a place to snuggle up with a book or daydream. You’ll have the perfect place and space to let your kids play, explore and perform. Cottage industries are popular today. If you create handmade articles for craft fairs or provide professional services such as tutoring, dance or music lessons, your old dining room would be the perfect place to set up shop. Dining rooms are typically toward the front entrance of the house, so if you are having students or business associates in, this is a great location for keeping business separated from the rest of your home life. Think through how you will want to use the space to determine the best way to furnish it. Do you need a work table or artist easel? A desk and guest seats for visitor consultations? Multiple work stations for groups of students at a time? If your dining room is open to the rest of your house, you might consider putting in walls and doors for work privacy or possibly purchasing a standing screen to at least block visual distractions. These are just a small assortment of the possibilities for the underutilized dining room. You are only limited by your imagination. Take some time to toss out old conventions, examine your lifestyle and set that square footage to work you!